Summer moments: ripe fruit, getting your college app essays out of the way. I work with students all over the country and the world on Skype. So far this summer, I’ve got clients in the Midwest, Hong Kong, New York City, Saratoga Springs, and Martha’s Vineyard. You can usually find me in New York City, but when summer comes, I roam and rove, usually around New England. From now until the end of July, I’m on the border of Cambridge and Somerville, MA. If you’re in Boston, Cambridge, Somerville – or anywhere in the vicinity – I’m holding a drop-in essay clinic five days this July. Just call or email me the day before, come for a minimum of an hour, and bring your questions and essay drafts. I’m also available other days and nights for private sessions. If you’re interested, these dates are open: July 15, 18, 20, 25, 27. I’ll meet you at Porter Square Books, in the Porter Square Shopping Center, and we’ll find a quiet place to work nearby. If you’re interested, please email me or call for prices. I have flexible fees and a sliding scale. 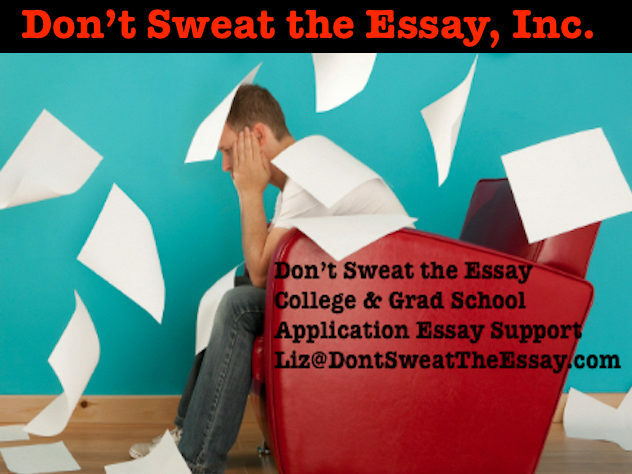 Liz@DontSweatTheEssay.com. 1-855-99-ESSAY. Please check out my TESTIMONIALS on this site to find out more about how I work. And thanks for stopping by.